In the wake of Julius Caesar’s death and the defeat of his assassins, the world is divided between Octavius, Caesar’s heir, and Marc Antony, Caesar’s trusted friend. Passion and history collide as the flagrant romance between Antony and the Egyptian queen Cleopatra threatens to topple the already fragile power structure. Brass Tacks Ensemble presents this sweeping, tragic and oftentimes humorous drama about two rulers whose love was too large for this small world. 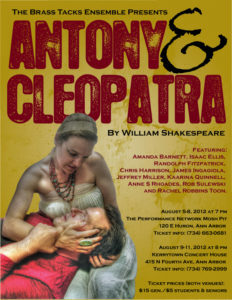 The cast of Antony & Cleopatra includes: Amanda Barnett, Isaac Ellis, Chris Harrison, James Ingagiola, Greg Kovas, Jeffrey Miller, Kaarina Quinnell, Anne S. Rhoades, Rob Sulewski, and Rachel Robbins Toon.